WingTsunKungFuWear.com - our shop is back online! Wing Tsun Kung Fu Wear, the online store of WingTsunKungFu.com, offering T-shirts, long sleeve T-shirts, Sweatshirts, hooded Sweatshirts and more. Members of the first Canadian Wing Tsun Kung Fu School in Vancouver, BC will find the collection of official Member Shirts. You can find the shop via www.wingtsunkungfuwear.com or also www.wingtsunkungfushop.com. Regarding training, I do have a question which came to mind today. You have constantly encouraged us to train harder and harder. It is understandable, since you are trying to push us to achievement as our Sifu. However, is there also a limit when the amount of training becomes counterproductive (for example, overtraining)? Heavy Bag training = 30 min punching on the bag with focus on power and natural movement. Also, using body to absorb impact from swinging bag to train stance and balance. Strength training = max 10 palm push-ups, max 10 fist push-ups, max 10 back of palm push-ups, max 10 fingertip push-ups, max 10 front crunches, max 10 left-side crunches, max 10 right-side crunches. about 30-40 min, but still working towards max on push-ups. Stretching = 30 min stretching arms and legs to maintain flexibility from strength training. At first, the schedule seems fine and I noticed gains in fitness. However, now I am feeling more physically drained and tired throughout the day. This was noticeable after adding the strength training into the training schedule. I see how Wing Tsun relies on natural attributes, skill, and intent (survival instinct, determination, etc.) to work. In training, we try to boost all of these to the best level as possible. However, with a full-time job and other commitments, it is hard to fit in a serious training schedule. The current training schedule I follow don't leave much time to rest, and I'm kind of suspecting this is an issue. Time is limited for anyone, and that means we have to train smarter and not just harder. Thanks for your e-mail. Of course there can be such a thing like too much training, overtraining. It also very much depends on the person. Some people work enormous amounts of hours and don't get anywhere. Not the number of years, not even the number of hours, it's the intensity we put into each workout, which will make a noticeable difference. Sometimes it's also good to take a break. Don't do anything for a week or so. Become aware of your motivation. What was your original motivation to start with? Have your goals changed? Why do you do certain workouts? Are they still effective? As we need to analyze our training, also do check your motivation and goals. At times we need to change the routine, switch to different or different types of exercises. If you feel tired and drained, note that there might also be a period of adjustment when we change our workout routine. Think about nutrition, a diet you may need, to go along with an increasing load of workouts, more sleep, or little power naps, vitamins, drinking enough water, etc. There are many factors that can lead to you being physically drained. Go out for a walk, have a nice dinner with someone. Don't neglect other parts of your life. Have a social life. Don't just think about training. Wing Tsun is an amazing art of self-defense, can lead to life-long commitment and improvement, but there is also more to life than just Kung Fu! That's why it's good at times to slim the Kung Fu schedule, or the workout schedule at home and concentrate for a while on other hobbies and activities. After a couple of weeks, get refreshed back into a workout routine that challenges you once again. Train smarter, not always harder. Time is an extremely valuable commodity! Sihing Brian Yam, second instructor level and one of the senior trainers at Wing Tsun Kung Fu Vancouver, will soon be introducing a new class format. 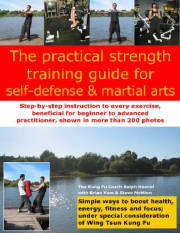 Brian is also featured in the upcoming book "The practical strength training guide for self-defense and martial arts." 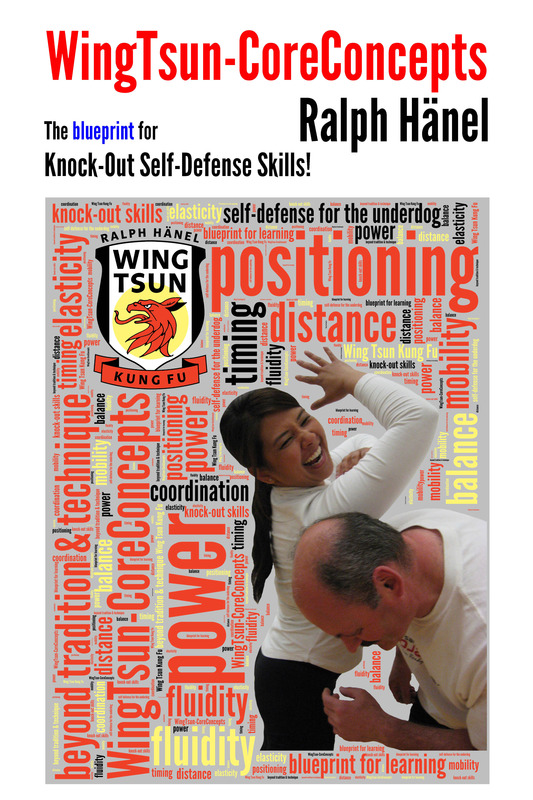 The first class "Fit for Self-Defense" is scheduled for Monday, October 15th, 7-10pm. Step by step, considering the different fitness levels, will Brian guide you through a variety of exercises to increase your stamina, punching power and mobility. 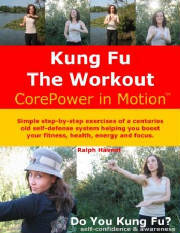 This class is designed for all members of Wing Tsun Kung Fu Vancouver. There will be no extra charge. Click here to view a videoclip of a Wing Tsun Kung Fu demonstration Brian gave during one of this year's Open House events. Members at our school know the drill. Often, when I work with newcomers, I engage them in a controlled self-defense scenario, asking them to punch me. I explain that any kind of strike to the upper body, stomach too, even to the side of the neck is OK.
- I can't hit the instructor. - What do you mean, hit harder? - What do you mean with "really hit me"? - I don't want to hurt you. - Why is nothing happening when I punch you? Am I now one of the toughest guys there are? Well, far from that. We teach Wing Tsun Kung Fu, a realistic self-defense system that teaches us how to aggressively attack the attacker in order to combat violence. Even if it sounds controversial, we do so in a friendly supportive environment. I am the instructor who wants to prepare you. I want and need to teach you the reality of what it could truly mean, to have to defend yourself. For that it is also my job to give you feedback on your punching power. In my opinion, if there is a problem hitting somebody in a friendly controlled scenario, what makes us think we would be able to do so in reality, in a adrenalin heavy, sudden and surprising scenario? You fight how you train. We teach increasingly stressful scenarios, to prepare you for the worst. Do you now have to suffer in your Wing Tsun training? Of course not. Will you be surprised, at times possibly shocked about the reality needed to learn to defend yourself? Most certainly. As students you don't have to punch each other. Don't worry. Only instructors I expect to work with each other with the right amount of contact. Because the instructor (in our opinion) has to be experienced enough to introduce you, the student, over time to all kinds of real life scenarios. The instructor will "act" like different types of attackers would, to share his experience with you, to teach you what you might be up against. If I wouldn't let you hit me, I would not provide you with the best feedback for your improvement of striking power, balance, timing, coordination, distance and more. If you are not allowed to touch your Sifu, because his techniques are so "dangerous", or out of misunderstood tradition and misuse of the term 'respect', quickly look for a different school. But that's only my personal view. Due to constant personal supervision we ensure that you improve and are not exposed to senseless hard contact. You can work with any amount of contact you feel comfortable with. After all, the learning of self-defense includes the growth of a healthy dose of reliable self-confidence. It's OK to take your time! IMPORTANT - We want to learn how to avoid any fight before it even happens!! Coming in October. Join us for a multiple-part series under the title: "When does Self-Defense start? or The very first line of Defense!" Train with us during the next Open House event! Welcome back Ada and Natalia. It's great to have you back in class. Also a warm welcome to our new members Mona, Rosemin, Francine, Jennifer and Sarah. Sarah has already been working hard for a while in group and also private classes! Wing Tsun Kung Fu Vancouver, a independent school established in 1994, is the first Canadian branch of the Wing Tsun system. All of our current members are looking forward to this year's third and last special topic seminar on September 24th and 26th, featuring a set of unique exercises to encourage allover fluid movements, continuous re-positioning, and the constant coordination between hand and foot movements for improved striking power and defensive capabilities. The seminar is designed for all skill levels, including new members who have just started their training, and also offers the possibility to sign up for testing. Plan on checking out Wing Tsun for the first time? Come to our next Open House event for a free trial training period at our School. The Fall Special in October 2007 features the participation in two consecutive classes, commitment-free. Click here to go to our special Open House web site. Coming up soon. Join us for a multiple-part series under the title: "When does Self-Defense start? or The very first line of Defense!" "Last night I pulled out an old 8mm video taken about 3 years ago. The one hour of footage contained scenes of me and some training partners practising. I was very surprised how poor my posture was, while standing and in position for practice. I did not realize how badly I slouched and how far my neck was craning forward. To this day, I am sure sometimes I fall back into a slouch but at least I seem so much better aware of it inside and outside of classroom whenever it happens and I immediately correct my posture." What's so great about that? Well, even the first form of the Wing Tsun Kung Fu system, the Siu-Nim-Tau form teaches us already to work on one issue, one idea at a time. The form teaches us to analyze our movements, positions, angles, power development and more. Sometimes it's just great to look back at something that we have accomplished. One part of the hard work done. Many more to go. There is luckily no instant gratification. It's the appreciation of one achievement, one piece of the big puzzle. Keep training hard and enjoy discovering what the term 'martial ART' truly means.